I tried something a bit different with the coptic stitching on this one as the cover was so plain, I thought it added a bit of interest. 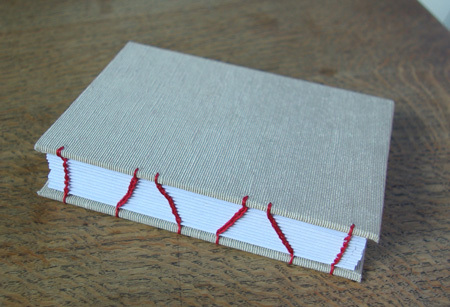 I love the contrast between the plain cream linen bookcloth cover and the wild Chiyogami paper on the end papers. I have had a request to sell some of these books so I am going to get stuck in and make as many as I can for Christmas. Then we shall see! Wow, those are some neat stitches, the diagonal lines are also add an interesting touch. 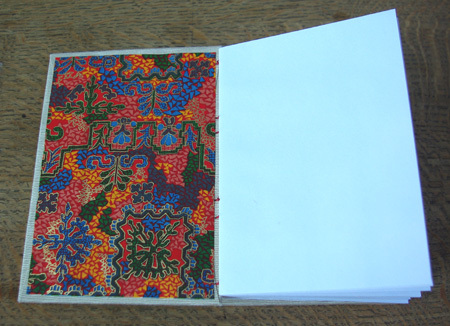 The colourful patterned paper inside makes up for the plain cover. It’s a beautiful product. Thank you! I like it. Plain on the outside, wild on the inside – sounds like me! You’re welcome. I’ve done some coptic binding and some general experimentation with paper. My coptic one was 1.5×2.5 inches and had a pink cloth cover with handmade white paper inside. The thread was bright blue. I love that little book and filled it with song lyrics and drawings. I still have it (not here though). I was surprised it came out so neat considering it was so tiny. Nothing as neat as yours though. Binding used to get my blood punding. Vintage fan, sounds amazing. I couldn’t even think of sewing anything that small, my eyesight is getting so bad! Rudi, thank you very much! I hope you enjoyed your holiday. You were not far from me! I hope the weather was kind to you! 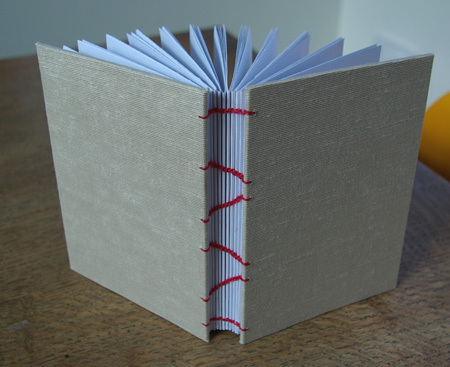 Hi, I’ve just looked through the pictures of your handmade books – they are so beautiful. You’re obviously a very creative person. I’ve love to be, but unfortunately I don’t have the patience. Really good blog as well, I noticed we share some favourite books and films not to mention a fondness for Dorset! Thanks for the compliments – very gratefully received! Dorset is indeed a fine place – so photogenic. Now if we can just do something about the weather…..!